Wrinkle-free clothes are quite ideal in this modern world whether you are ironing a suit or your favourite dress. In fact, some people have gone to great lengths to get that clean, crisp look in their garments. A steam generator iron is a great tool that can achieve that freshly pressed look and is a great value for the money. Unlike regular irons steam irons use not only a hot seal plate to iron your clothes but it steams them as well. What is a steam generator iron? A steam generator iron is a clothes iron that you fill with water and as it irons your clothes it also steams them leaving you with a dry cleaned look. A great iron will glide smoothly over any type of fabric as it steams to give you the best looking results. There are some really great best priced steam irons on the market today that will iron your clothes with steam giving it that dry cleaned look without you ever having to go to the dry cleaners. Below are a few of the best irons for the money that we reviewed for you. Each of them have their own unique features and are considered some of the best selling items on the market. These are really amazing quality steam generator irons. The Tefal Gv8461 Steam Generator Iron is such a wonderful iron that cuts down your ironing time by half. It has a simple one touch button system where you touch the the type of fabric you are ironing and it automatically adjusts the temperature and speed to the proper levels. This iron has a powerful steam output due to it’s 6 bar pressure and turbo steam system that aids in faster and more efficient ironing. It puts out 120 grams of steam per minute. It also features an anti-calc system that removes calc from hard water for you so that you don’t end up ruining your clothes from hard water. The Tefal GV8461 Pro Express Autoclean Steam Generator Iron’s soleplate is scratch resistant iron and has an auto-cleaning setting that will clean the sole plate for you easily. This steam generator iron from Tefal also has retractable cord and auto-off setting. With the retractable cord and easy lock system this iron can easily be stored away in no time. It is also very eco-friendly and has an eco setting that saves your energy by 20% This iron has been rated by many has a best selling steam generator iron. Overall, it is very useful, eco-friendly and highly durable. You can not go wrong with such an amazing iron. Not the model for you? 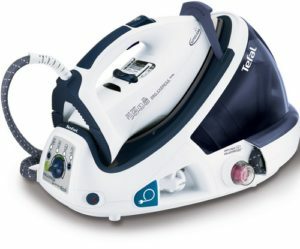 Have a look at our detailed Tefal steam generator iron reviews. 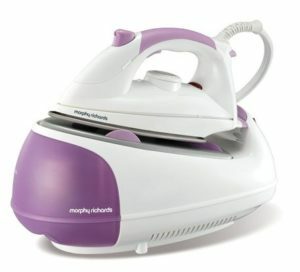 This steam generator iron from Morphy Richards is a reliable and durable steam iron that really gets the job done. The Morphy Richards 42244 Jet Steam Iron as a steam output of 100 grams and can hold up to 1 litre in its large removable water tank. Having such a large water tank is ideal so you are not always having to fill up your iron at each use. This steam generator iron also features a diamond style sole plate that aids in gliding over the fabric with ease and was built for durability. 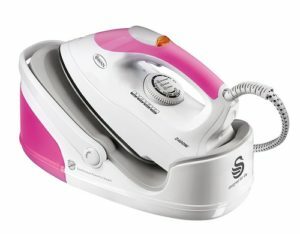 The vertical steam slot on this iron really helps to iron efficient as it relaxing fibres. It also comes with a nice steam trigger and an anti-scale filter to help you achieve great results while ironing your clothes. This Morphy iron comes with a two year guarantee. All in all, this is one well rounded iron that has many high reviews and has been proven to do an excellent job ironing garments. 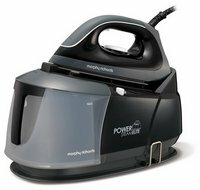 If you are looking for a Morphy Richards steam generator iron, check out our reviews page. The Morphy Richards 332004 Power Steam Generator Iron is a powerful steam generator iron that not only irons your delicates with such precision and care but it also irons your thick, hard to iron garments and linens with great ease. It really glides over the toughest creases with in no time. This iron has a constant powerful stream of steam that has an output of 170 grams and a 6.5 bar pressure. 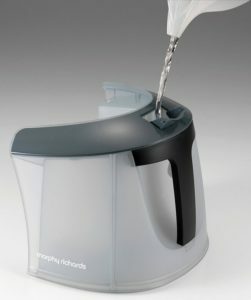 The Morphy Richards 332004 Power Steam Elite not only heats up quickly but it also has a rather large 2.2 litre water tank so that you are not constantly having to fill it up. The ionic sole plate is durable and static free giving your clothes the best results possible. It has an auto clean feature that also descales so that you don’t have any limescale build up or cleaning to do. This steam generator iron locks to its base for easy carrying and storage. Also this iron has an nice auto safety off feature just in case you forget to shut it off. The Morphy Richards 332004 Power Steam Elite Generator Iron comes highly recommended as a powerful, durable tool that will make steam ironing all your garments a breeze! Not all steam generator irons are bulky. The Philips GC7619/20 Steam Generator Iron is compact and lighter than most other irons. The compact size is nice for storage and ease of use. This remarkably compact steam generator iron has 5 bars of pressurised steam with an output of 200 grams that can get out even the toughest of creases. It features a one touch setting system for fabrics that will adjust temperature and steam according to the fabric type. 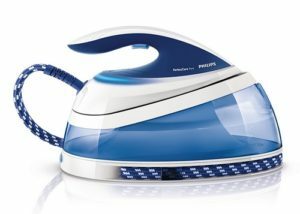 This iron also features an ionic soleplate that glides over fabric easily, is static free and will not burn the material. This Philips iron also has removable anti-scale filtration cartridges that help remove limescale build up and will protect your clothes. If you are looking for an affordable, compact, steam generator iron that is durable and really irons your clothes effortless this is an iron you will should look at. It has been reviewed as a best seller. The Swan S1902N is a 2400W steam iron capable of producing 90g of steam per minute. This steam surge function and heat applied allows you to iron a wide range of tough fabrics, such as denim. You can plug and iron from long distances with the 2 meter cord. The whole unit is lightweight allowing you to iron a pile of clothes without feeling exhausted. A detachable 1.7 L water tank can be easily re-filled and this tank capacity allows you to iron many clothes before you can make a re-fill. A vertically applied and powerful steam shot offers deep fabric penetration to deal with tough creases. Automation regulates the amount of steam and temperature allowing you to iron many fabrics including silk and cotton. This iron glides smoothly over fabrics for flawless ironing results. An anti-limescale filter helps in removing dirt deposits and dirty water, helping to prolong the life of your iron. Its also constructed with a carrying handle which makes it easier to transport and store. This iron provides you with almost all the features of an advanced iron for a reasonable price. For reviews of other Swan steam generator irons, click here. This steam iron makes use of VarioComfort9 technology with intuitive programs to offer optimal results. It handles a wide range of fabrics including cotton, wool and silk. 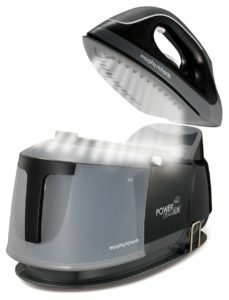 I-Temp advanced technology allows you to iron fabrics faster and easier without having to make temperature adjustments. You don’t need to pre-sort your clothes since the right temperatures are provided for each fabric. It’s power rating is 3100 watts which delivers 120g/min continuous steam and adequate heat. The Bosch TDS3872GB produces 40g shots of steam which are capable of deep penetration in order to deal with stubborn creases. Well-placed outlet holes with steam channels are used to deliver the steam. Multiples holes ensure that steam is well distributed over the fabric to help with even ironing. Energy saving steam settings allow you to save up to 35 percent of energy and 40 percent of water. The Bosch TDS3872GB comes with a very efficient cleaning system both for the iron and the steam station. A self-cleaning mechanism helps to remove limescale deposits collected by the iron by simply shaking the appliance. An efficient cleaning mechanism helps promote the life of your steam iron, so its good to see these features on this iron. Below the iron is a hard surface coated with enamel that allows the iron to glide over your fabrics smoothly, producing perfect ironing results. For reviews of other Bosch steam generator irons, click here. Settings: Every iron comes with different settings such as low, medium or high or they also use it in terms of fabrics being ironed such as cotton, linen, silk and wool. Each type of fabric should be ironed at a different heat setting. An iron with quick easy buttons are typically the best especially if it has automatic settings. Weight: The average weight of an iron is typically between 2 to 3 lbs. You don’t want an iron that is too heavy because over time it may just be too heavy for you to lift. Most of the new models are lighter and still do an amazing job at ironing your clothes. Durability: You want a well-built steam generator iron with a good solid sole plate that is scratch free and made from non-corrosive materials. Buying a cheap iron that is not durable may cause you problems. Also, it’s a good idea to look at the manufacturers warranties when buying an iron. This will help ensure that you bought a durable iron that the manufacturer guarantees. Cord: Most irons are still corded. You probably want an iron with a long cord for the most flexibility in movement. It’s also a good idea to look for a retractable cord for easy storage. Steam Boost: This button will give you a steam boost, it is good in those hard to iron places! Anti-Drip: An iron that has an anti-drip feature is great. Often times if they don’t have this feature it can cause the water to leak from the tank when you place the iron at different angles. Eco Setting: Some irons offer this feature and all it really does is help save you energy which is great since we are trying to become a more eco-friendly plant. Auto-Off: Ever leave the house and wonder if you turned your iron off? This feature will automatically turn an iron of after a set period of time. This is a nice safety feature to have. Ceramic Coated Seal Plate vs. An Iron Sole Plate: Ceramic seal plates or sole plates at the bottom of the iron evenly distributes the heat across the fabric for a smooth and seamless iron. An iron seal plate is durable, non-corrosive and very effective in ironing garments smoothly. Choosing between ceramic or iron sole plate is typically more of a personal choice. Large Tank: A nice large water tank on your steam iron will ensure that you don’t run out of water while you are ironing. A good size tank is typically about 1 litre or larger. Don’t forget to check out some of the best ironing boards when you are looking at irons. You will need a great ironing board to aid in ironing your clothes. Choose an ironing board that is a good size for your ironing needs and available space. 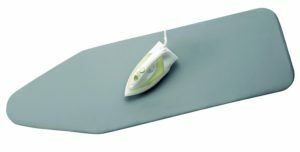 Most ironing boards comes with a removable cover that is easy to wash when needed. You can also purchase extra ironing board covers if needed.